Nowadays, many of us own a trampoline for use in our back yards. These can provide hours of fun and a great way to keep fit. Many people even purchase accessories such as trampoline tents and basketball hoops to make their trampolines multi-purpose and even more fun. One of the lesser-known trampoline accessories is a trampoline mister. So, what is a trampoline water sprayer, and should you purchase one for your trampoline? What is a trampoline mist sprayer? 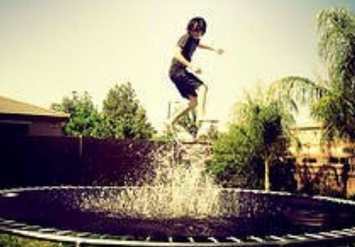 Does a wet trampoline make you jump higher? A trampoline misting system or trampoline sprinkler goes under your trampoline and sprays a mist of water up and into your trampoline. The purpose of having a trampoline sprinkler underneath is to cool you down as you use it. Therefore, this can be really useful if you live in a hot climate and are worried about your kids overheating when they're bouncing on hot days. However, many kids find being sprayed with water as they bounce great fun. Therefore, it can add an extra fun element to your trampoline. 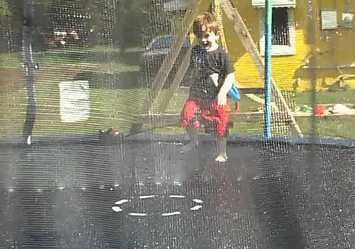 If you're thinking about buying a trampoline mist sprayer, you may be worried about the water damaging your trampoline. If your trampoline is built to stay outside permanently, this shouldn't be a problem if you are only using your mister for a couple hours at a time. That's because outdoor trampolines are built to be durable and to withstand wet weather. Most trampoline frames are also treated to be rust-resistant. However, we don't recommend using a trampoline misting system on a rebounder or small trampoline designed for indoor use. A wet trampoline will be more slippery, but as a jumping mat provides a soft landing this shouldn't cause a safety issue. However, if you're using a trampoline misting system, it's more important than ever to have a net safety enclosure on your trampoline. Also, ensure that kids can't slip down the gap between the bouncing surface and the frame. Most models nowadays cover this gap. It's also sensible advice to supervise your children getting on and off the trampoline if they have wet feet, as they could slip. 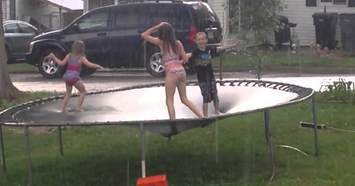 Using a trampoline in the rain is a fun and free way to enjoy being sprinkled with water as you jump. Many kids find this activity great fun. When jumping in the rain, you should still make sure that your trampoline is safely enclosed with a net to avoid accidents. If there is a large puddle of rain on your trampoline jumping mat, you shouldn't use it until it's drained away. Some people say that they feel a wet trampoline allows them to bounce higher. However, there's no real scientific evidence to back this up. If there is a lot of water on the jumping mat, this could weigh it down and affect the rebound. However, you should never jump on a trampoline with a pool of water accumulated on it because it can cause damage. If you don't want to splash out on a custom sprinkler for your trampoline, don't worry. 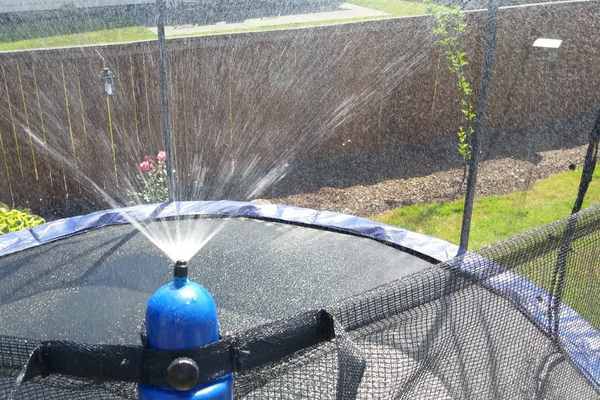 It's actually pretty simple to rig up your own DIY trampoline water sprayer without any specialist equipment. If you happen to have a lawn sprinkler, you can simply position it so that it sprays onto the jumping mat of the trampoline. 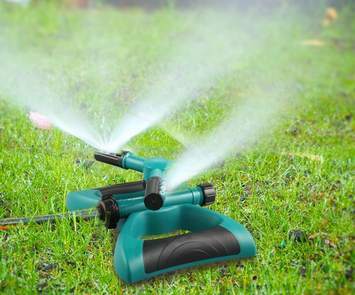 Click here to check the best lawn sprinklers. Alternatively, you can use a long piece of hosepipe attached to your outdoor faucet. Attach it to the top of your trampoline net pole, ensuring that it is angles downwards towards your trampoline bed. 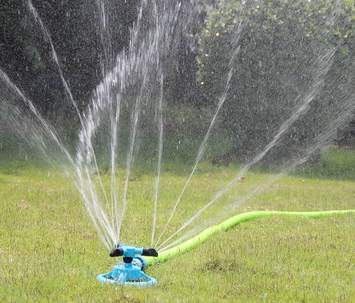 You will then need to attach a sprinkler head to the end of the hose. Alternatively, you could even use an old shower head. However, you may find that you need to use piping instead of a hose to get the shower head to attach. With both of these options, it's important to run them for a few minutes to check that they are not spraying so much water that a puddle starts to accumulate on the jumping mat. Jumping on a trampoline with a build-up of water can be unsafe and can damage your trampoline. If a puddle starts to form, you should allow it to drain away and adjust the water pressure to a lower setting. Unfortunately, a sprinkler placed under the trampoline is unlikely to have much of an effect. This is because the material of jumping mats usually has a very tight weave, so not much water can get through. While this may seem like a pain, the tight weave makes the mat more durable and improves the rebound. 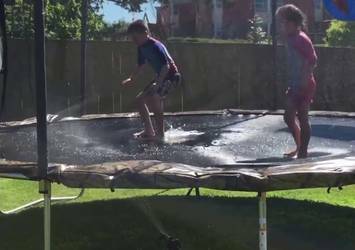 As you can see, a trampoline sprinkler can be a fun addition to your trampoline and prevent you and your kids from overheating in the hot summer months. 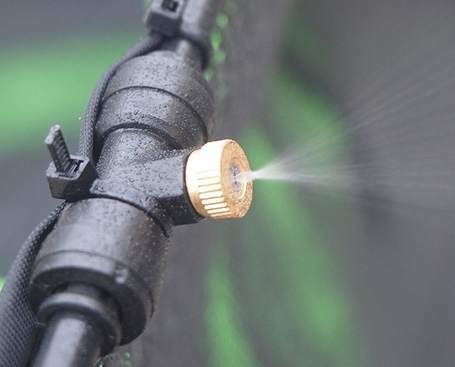 You have lots of options available, whether you choose to purchase a specially-designed trampoline water sprayer or make your own DIY option at home. Remember, always check that your mister or sprinkler is not causing water build-up to accumulate on your trampoline. Happy bouncing!